When most people think of making a summer dish, soup probably doesn’t immediately come to mind. Summer warrants cool and refreshing, not hot and comforting. 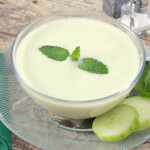 Have you ever tried chilled soup? 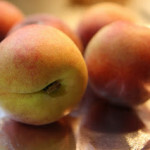 They’re the most refreshing appetizer to any summer meal and they’re simple to make. My mom was heralded for her Chilled Cucumber Soup. It always perked eye brows and taste buds whenever it was served. She usually whipped up a fresh batch before we went over someone’s house for dinner. The Cuisinart would be humming as the cucumbers and yogurt and buttermilk were mixing. After her pinky finger taste tests, when she was satisfied with the taste and consistency of the mixture, she’d pop the finished product in her large round Tupperware container for a few hours to chill and set in the fridge. Then, off to the neighbors we’d go. No bowl of Judy’s Cucumber Soup would be complete without her generous dollop of fresh sour cream to help pollinate all of the different flavors. 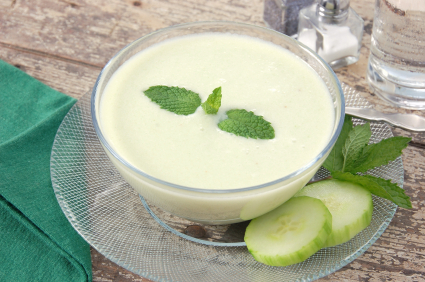 Enjoy this refreshing chilled soup during the dog days of summmer. Peel and chop the cucumbers. Place the cut pieces in the blender along with lemon juice, buttermilk, yogurt, dill and scallion. Blend at high speed until consistency is thick and soupy. Chill in refrigerator at least an 1-2 hours before serving. Add a dollop of fresh sour cream to the top of each bowlful of soup! Enjoy. 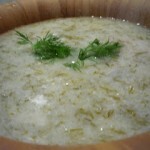 Thanks for sharing this yummy and healthy soup recipe.